Congratulations Jaylene!! Send me your snail mail address and your 100 Blocks Magazine will be on its way to you. And hang in there everyone. I will be giving away another copy tomorrow! Whoo Hooo! This week is so exciting! 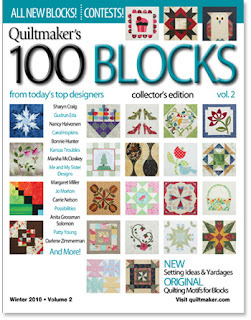 My block Rising Star is among the blocks featured in Volume II of Quiltmaker’s Magazine’s 100 Blocks issue. Actual Photo of the Rising Star Block Block #106 in the Magazine!! I came up with the idea for this block while learning to use the Patch Draw worktable on EQ6. I wanted to play with the circular grids and see if I could design a star block that looked different from a traditional radiating star. Once I settled upon the design, I played with color to get the illusion of a spinning star, throwing off its colors as it spun. Here is one of the first designs I came up with for a quilt using this block. I alternated blocks with another block I submitted (but wasn’t published) called Winter Sun. I loved the combination of batiks and dots in the cool shades and repeated them in the chunky borders. Then I started playing around with other setting ideas in EQ7 and came up with a whole bunch of fun ideas. This next setting uses the same blocks and border, but reduces the number of blocks to 4. It is 29” x 29”. In each of the settings I have shown so far I have reduced the size of the block from 12” to 9”. I liked the proportions of the block to the border better at that size. So after playing with size and the number of blocks I had to play with color. I used the “Random Recolor” feature in EQ7 and came up with dozens of new color combinations. Total funnage!! I used Kaffe Fasset fabrics to pump up the color and simplified the borders to keep it from being too over powering. I just loved all the dots. I changed the background dots to a calmer fabric to punch up the brighter colors of the spinning star. Design 5 (above): Summer Night. In this setting I put the blocks on point and recolored again. Partial stars make up the setting triangles and corners. The secondary stars really take on a life of their own in the small white dotted fabric. I love this setting. Wouldn’t it make a great summer night quilt? It is hard to stop playing with settings once I get started, but if you have hung in with me this long, I have a surprise for you. Let me know which setting(s) you like best -- by leaving a comment on this post -- and you will automatically be entered to win a FREE copy of the Quiltmaker’s 100 Blocks Magazine . One person will be chosen at random from all comments received before 11/15/2010. Keep reading because I am giving away more stuff before this post is done!! Surprise #2 -- the winning setting (the one with the most votes) will be patterned and available for Free to everyone who left a comment!! 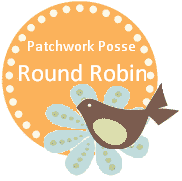 I will send you a link to download the complete pattern for free. These are both on-point settings where I played with color and different setting triangles. I also reduced the number of blocks in the second of these designs. If you click HERE you will be able to download a pdf of the templates to make this 12” block and click HERE for the templates for the setting triangles. Here is a yardage chart. And if you want a sunnier version of this same quilt, how about this? If you want a really fast method to make this quilt, use a piece of interfacing! Download the full size block outline HERE and trace it onto the interfacing or place it beneath the interfacing so you can see the lines through the interfacing. Cut the templates out and arrange them on the interfacing with the glue side up. When all the pieces are arranged and touching, iron them down onto the interfacing. Add the borders, then layer with batting and backing. Then satin-stitch or zig-zag the seams to hold all the patches in place. Use a variegated thread to add to the composition or an invisible thread to disappear into it. You will be stitching through all the layers so your quilt will be quilted at the same time that you join the seams and edge-stitch. WOW, is that fast or what? Your finished original masterpiece will be 21” x 21” – a perfect size to hang on your wall, in your cubicle, or next to your desk to remind you of the rising stars in your life. Cutting List: Innermost border cut two 1” x WOF strips. Middle border cut two 1” x WOF strips. Outer border cut three 1.5” strips. Binding cut three 2.25” strips. Now that’s a cool Give-away!! I can’t wait to see what you come up with. And check out my ad in the front of the magazine!!!! on page 9! and the setting ideas using my block on page 16!! And watch for an upcoming preview of next year’s FREE Block of the Month being offered on my blog. Thanks to all of my friends and readers. You are the best.